Projection: First Light is a new action adventure game developed by ‘Shadowplay studios, Sweaty chair and Blowfish studios‘. Projection: First Light is said to be coming out this year (2019) on Xbox One, Nintendo Switch, PS4, Mac and PC. Now this game does have a very cool mechanic. Let’s take a look. In Projection: First Light, players control a girl called Greta. This girl is living in a strange world. Basically it’s a shadow puppet world. Greta is on a journey of “self-enlightenment”. She will travel through different cultures and explore them. The places named are: Indonesia, China, Turkey, Greece and England (19th century). Now these places are very different from each other allowing for level variety and creativity. Off course this shadow puppet world is mythological. So don’t get all historian on the game. Now Greta will not be completely alone in Projection: First Light. Within each culture she will be assisted by heroes who have been described as legendary. How they will assist you? Not clear right now. They could be a guidance who show up to give help and tips. They could maybe grant a special ability for that culture at the time etc. We have had a bit of fun trying to think who these ‘legendary’ heroes could be. 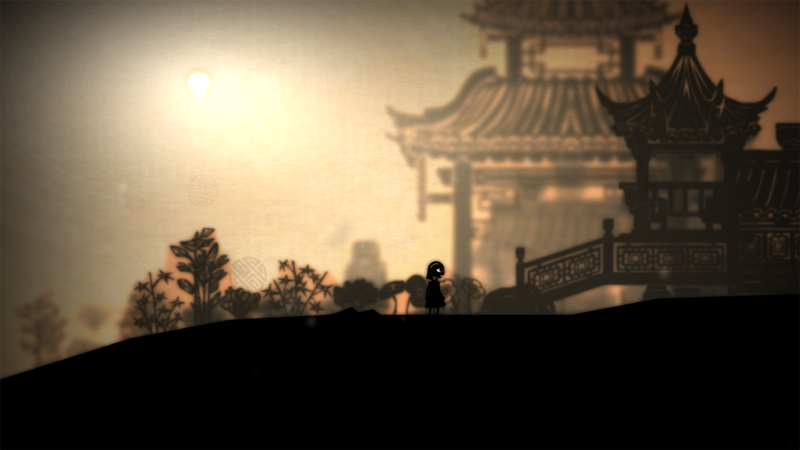 Projection: First Light introduces players to the main mechanic of the game early. Near the start of her journey, Greta receives the ability to control and manipulate a source of light. Players can use this ability to therefore effect shadows. In Projection: First Light, shadows are platforms and walls. So by moving and shifting this source of light, you can lengthen and even move shadows to allow you to jump across or interact with other things. You can use your ability to also solve puzzles or ruin them and even deal with shadow enemies. 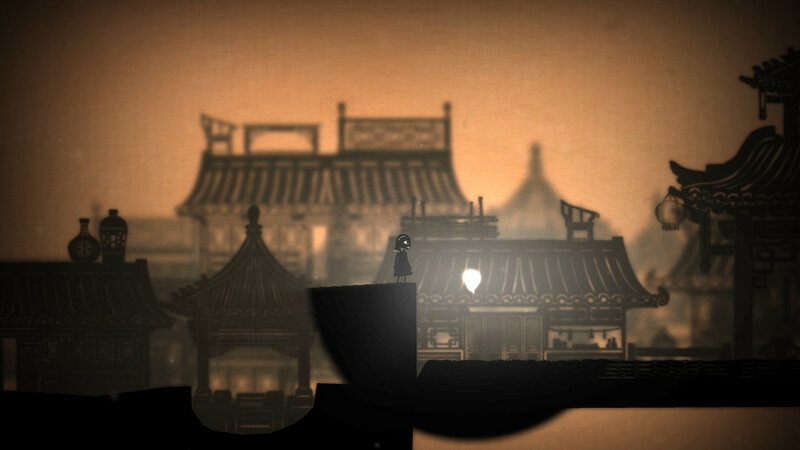 We checked out some gameplay of Projection: First Light and off course many gamers will instantly think about Limbo. Again, another simple game with simple controls, limited colours and travelling in one direction mostly. The graphics are very good for what it is and the sounds are also very good having sound tracks made with antique instruments. At the end of the day it’s another game like Limbo. Meaning most gamers should know what to expect round about. We currently aren’t impressed. 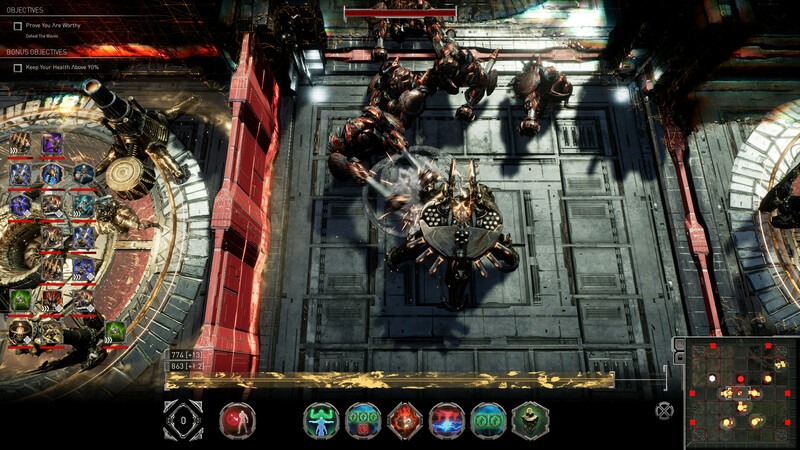 Golem Gates is a new real-time strategy (RTS), multiplayer online battle arena, card battle game developed by ‘Laser Guided Games’. Golem Gates is coming out in April 2019 on the Xbox One, Nintendo Switch and PS4 but already out on PC. Quite a bit of good stuff is being said about this game. Let’s take a look. In Golem Gates, the universe is very different. 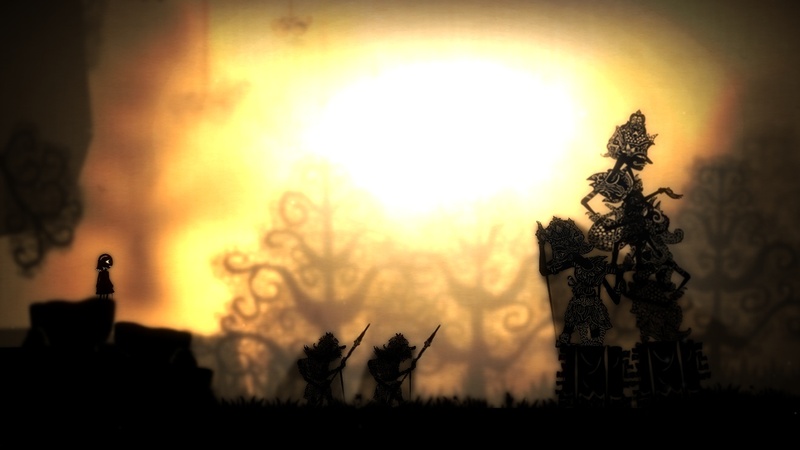 The game takes place in a land that has been damaged and ravaged by wars… ancient wars. There are Golem Gates which spawn and release ancient warrior machines. 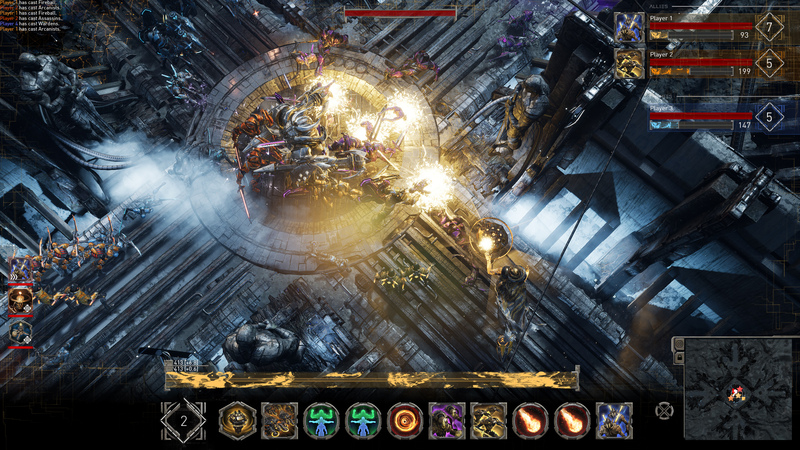 Players control a character known as the ‘Harbinger’. You are an outcast who has the ability to command manipulate nanites from a remaining power called ‘The Ash’. You will have to face these ancient warriors, these golems and off course learn and solve the mystery surrounding the long lost creators of the Golem Gates. How the game works is not so simple. Players must collect spell cards (this isn’t Yu-Gi-Oh) called Glyphs. Players must then use to build a deck. This deck is what you will be using in combat. Battles have be described as “fast-paced and highly tactical”. Decks, cards all means that Golem Gates has resource management. The glyphs are a big part of Golem Gates but not all there is. There is more. By the way we don’t look ahead on the PC version of the game as that just ruins out for us. Players will have to build their army, bulk up their forces and definitely get tactical. Expect some objective styled missions like capturing and holding locations. Head on battles and collision will be everywhere and players need to focus on the battle at all times. These ancient warriors aren’t a joke. Now back to the glyphs. Use the glyphs to call in the buildings which provide that field and presence advantage, traps for turning attacks in your favour, units for off course fighting and even tech for that extra boost and advantage. There is even buffs to make your units plus others more powerful. Another feature in Golem Gates is that players can make moves and play glyphs at almost anytime and anywhere pretty much. If you are there, then you can do it. You can use the glyphs to do almost anything. You can drop in emergency defences, turn weak scouts into a dangerous army, add a bunch of units to your army and even hide a whole outpost. Don’t get too excited though, as your enemies can use glyphs too. 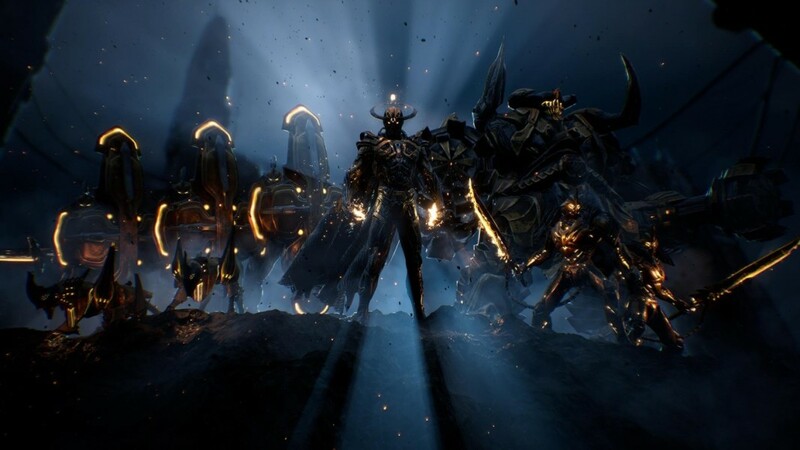 You can literally spawn and build in a powerful army but with one glyph your enemies can make that whole army get destroyed. We checked out some gameplay and the main thing is how good Golem Gates look. The graphics are very good and the details of these characters, units and even the effects of the lightning and attacks are detailed. Many have commented on how good Golem Gates looks rightly so. We are liking the different size and designs of the units, especially the big one. We liked how the battles come off as really big ones. Units clashing, large units getting a lot of attention and how the battles can easily change in favour and direction through the glyphs. In some ways Golem Gates does remind us off Supreme Commander 2. 9 Monkeys of Shaolin is a new beat em up game developed by ‘Sobaka Studio‘ and published ‘Buka entertainment‘. It is said to be coming out in the third quarter of 2019 on the Xbox One, PS4 and PC. It’s said the gamers who loved throwing and beating up enemies left right and centre will love 9 Monkeys of Shaolin. In 9 Monkeys of Shaolin players control a regular man. In fact he is a Chinese fisherman called Wei Cheng in medieval China. Basically a pirate raid happened at your peaceful village. During this raid, people died but also your friends and family. So off course Wei Cheng did what any other regular fisherman would do… get revenge! He sets out to avenge those who were killed. He’s armed with basic knowledge of ancient martial arts and a battle staff (we love this weapon). That’s all he needs. If you played old school beat em up games then you will pretty much know what to expect from 9 Monkeys of Shaolin as it’s replicating the old school style. Advance to the next area and beat up everyone who comes for you. Then advance once again and beat up everyone there too. Off course the game has been modernised. Now this beat em up is also multi platformed. So expect more mobility than your average old school beat em up. There are three styles. Three different fighting styles that players will need to master and use to their advantage: fighting on earth, in the air and magic seals. Already you can see where this is going. So if enemies want to stay on your level and duel then beat them with solid earth combat. If an enemy his launched or above you then take the combat into the air. We all know that magic is games is ranged attacks to buffing so they should really tip fights in your favour. There is also a character development system. 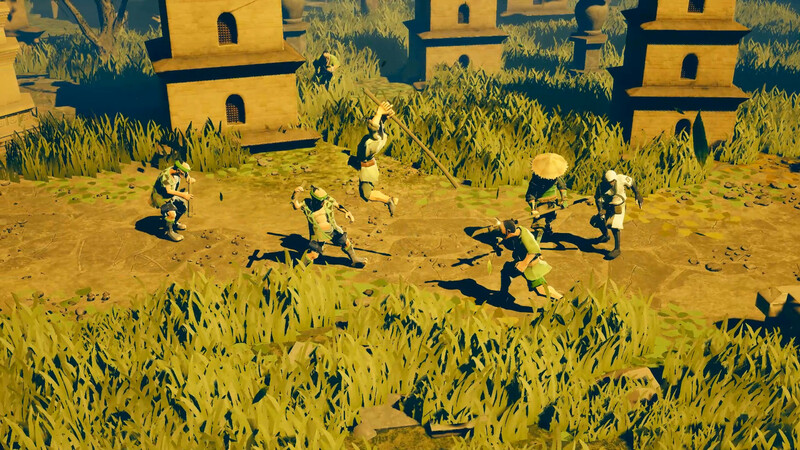 9 Monkeys of Shaolin has been developed in a way that allows players multiple ways to get the victory over the enemies. Variety is always a good option. There are fighting styles to unlock and master, perks to obtain and use, items to get your hands on and apply to the situation. The character development and what can be done goes quite deep. Remember that. 9 Monkeys of Shaolin has more than 25 different levels. So you can look forward to Japanese mansions, Chinese villages, buddhist monasteries, pirate ships, ancient ruins and more. We hope the variety in levels are deep and done well as it makes a big difference in games like this. There are at least 10 types of of Chinese and Japanese polearms. This has caught our interest as we like details like this. What type of wood are these pole arms made from. What about red wood? Interesting stuff. More interesting is that these different polearms have different unique traits. 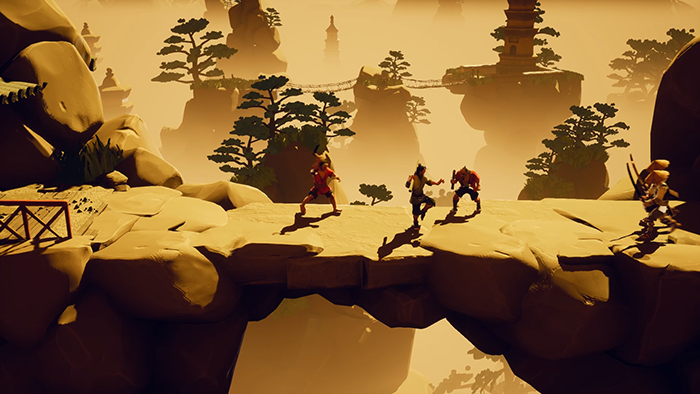 We checked out some gameplay of 9 Monkeys of Shaolin and it currently looks cool. It also looks quite deep. You can deflect projectiles, switch sides, combos, evasion and more. Magic seals have a variety of effects too and they help with set ups too. The combat is looking good. The art style is more simple and looks alright. We expected a bit better. 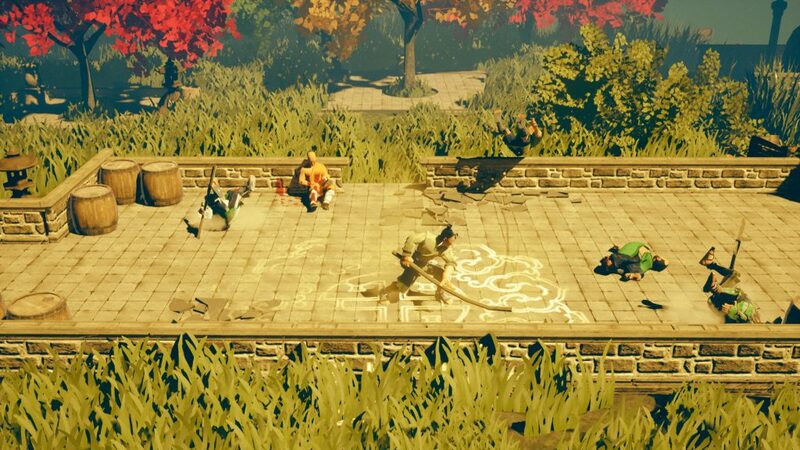 Our favourite thing once again is that there’s co-op multiplayer. You can play with a friend online or even better play local with someone. Cool right. 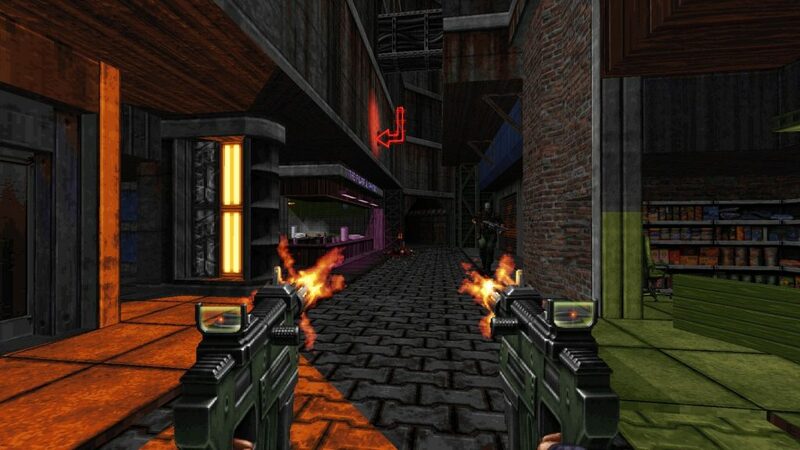 Ion Maiden is a new action first person shooter game developed by ‘Voidpoint’ and published by ‘3D Realms‘. It is said to be coming out in the second quarter of 2019. We know there’s an early access out already but we don’t care about that. Ion Maiden aims to bring back the old ways of first person shooters. Let’s take a look. The story in this world of Ion Maiden is that there’s an transhumanist mastermind called Dr Jadus Heskel. He has a full fledged “cybernetic cult” with numerous members. He has released them into the streets of Neo DC. Off course this causes chaos, destruction and loads of problems. This is where the players comes in. Players control Shelly “Bombshell” Harrison who’s aim is to take down Dr Jadus Heskel. Now Shelly isn’t a stranger to explosions as before these recent events she use to defuse bombs for the global defence force. but now she’s causing explosions in her battle against the cybernetic cult. Now Ion Maiden has a lot to live up to as it aims to bring back the style of the old first person shooter games like Duke Nukem 3D. 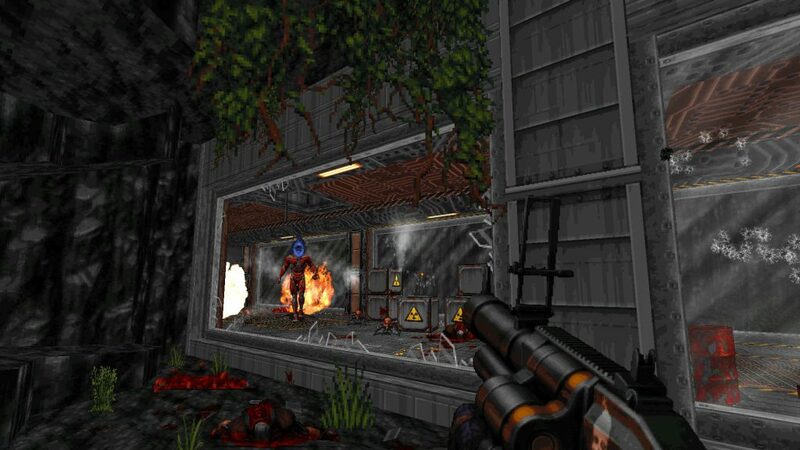 If you couldn’t tell from looking at Ion Maiden, it has the retro style look as well. 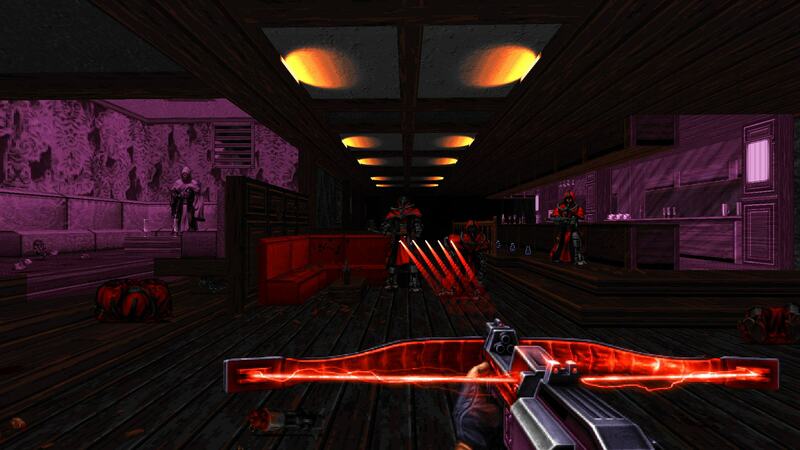 Players can expect the old gameplay style too in Ion Maiden. Strafing left and right, running and gunning, all that good stuff. There is no regenerative health, just like in Ultimate Doom, so avoid getting hit at all times. There are no mandatory check points either, so players better learn how to survive. The levels are multiple paths you can take to complete levels and you can expect enemies around every corner who are quite trigger happy. First person shooters like this need a wide range of weapons and options. Ion Maiden claims to have that. There are grenade launchers that can explode and release bullets like a shotgun, Shelly’s signature revolver which is more unique than your average Wild West gun, shotguns, dual wield sub machine guns, a cross bow, stun baton, grenades a chain gun and more. We hope Ion Maiden gets the weapon options right. Many games have guns that are clearly way better than others. Some guns will never get used unless the others run out of ammo. Options are a good thing. There is some more stuff going on with Ion Maiden though. It won’t be simply running around. Players can climb, swim, duck and jump. Imagine jumping in ultimate Doom. Some guns have different firing modes and there are different types of ammo too. There are seven different zones to fight through and each of those zones have their own levels so get blasting, shooting and exploding and don’t forget the running. We checked out some gameplay of Ion Maiden and it’s what we thought. It’s what any gamer who knows of Ultimate Doom and Duke Nukem 3D would imagine it would be. Run around, firing lots of shots, ducking and dodging incoming fire, discovering secret areas, finding new weapons, picking up health, gathering ammo and eventually facing the dangerous bosses that will be more than ready to fight. Anthem was released and many gamers had their eyes on it. Almost everyone heard about Anthem and there was some hype for it. Some were already salty because of what they think about Electronic Arts. We at X35 Earthwalker aren’t childish about these things. We look at the game that that’s it. We have checked out what some of these reviewers have to say about Anthem and so far a good number of them didn’t give a good review at all. Some like Angry Joe and others aren’t even that good at it and it shows. Check out what we think of it so far. We say “so far” as we haven’t completed the game yet or anything like that. Also this isn’t a full review as there is literally so much to say. Anthem can be played both single player and multiplayer. How we see to do it is that when it’s a story based mission, as in it forwards the story, we tend to play it solo but when it’s agent missions and others we then decide if we want others there or not. Now we do prefer single player overall because we get to do things at our own pace, explore around that corner if we want to and even get stylish when facing enemies. You can’t really do that in multiplayer. In multiplayer you have players who just want to complete the mission as fast as possible and so they zoom from objective to objective flying everywhere. If they reach the next area you have around 24 seconds to get there also or you’ll be teleported there. So it’s a rush. This doesn’t mean multiplayer isn’t fun. In multiplayer we have come across some playful and friendly gamers. If we throw a flare, they all do. In fact we once had a flare party where everyone was emoting and tossing flares everywhere. In multiplayer, there enemies don’t stand a chance. You feel powerful. Plus we have to admit that some levels, especially bosses are very difficult to beat alone and off course a team makes a difference. Now when do you get to play with others? The answer is whenever you want. Every time you go on an expedition you have the option as to whether to play with other or private. What they shouldn’t have done is keep presenting a warning or reminder that Anthem is better experienced with others and if you are sure you want to play private. Yes we are sure, that’s why we selected private and not public. It’s annoying that every time they have to ask you. It’s like they want us to doubt our choices. Just stop please. Other from that, the system works fine. You choose public and they find a team. The levels of your team mates are questionable but not a big deal at all. It’s minor. We tried three of the four Javelins: Ranger, Storm, Colossus (haven’t tried yet) and Interceptor. These four play very different from each other. Rangers are fighting like actual soldiers using mainly their guns and equipment as backup. Storm normally stay at long range and use elemental based attacks like lightning, ice, fire and even wind. The Interceptor is all about getting fast, do quick damage and then get back out just as fast. The colossus wants to get up in the enemies face and use some melee action while tanking some damage. When you play each one, it does feel different but the principle is still the same as in, don’t die, take cover to recover shields etc. Your strategy and style of play changes with each Javelin type and that’s a good thing. The enemies are quite similar to each other in some areas. 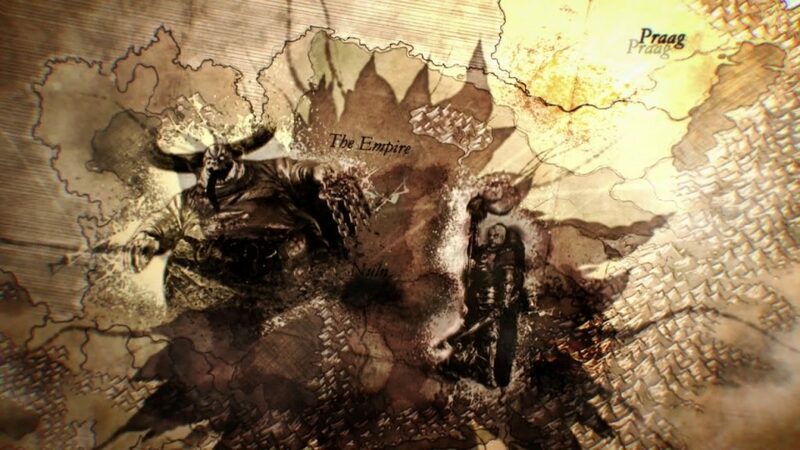 The main enemies are: Scars, Dominion and Outlaws. They have foot soldiers, elite versions of those soldiers, unique units and even a shielded unit. The three main enemy groups are different when it comes to their unique units. The Scars have a big flame throwing unit that uses a big physical shield to completely negate all frontal damage. It’s weakness is it’s fuel tanks. The Dominion have a large animal like thing that has a cannon on his back which is really fast. There are even more enemies too including the wildlife. An Ursix is a giant beast that throws rocks, charges and smashes you with brute force. There are more enemies to but some are passive and will not bother you at all, only until you scare or disturb them. We haven’t completed the main story yet but so far we do understand what’s happening. The shapers, shaper relics, anthem of creation, what the dominion wants, cataclysms etc. You can learn a whole lot more through the items that have information and lore like scrolls and books found in fort tarsus or certain identified areas in the main world that give the the background story and more. There is a lot of information to find and they do explain quite a lot. Some not good critics like PC Gamer complained that the story was complicated and confusing. We didn’t find it confusing, they were obviously rushing through the game to complete it to give their review. Take your time and you will see that it’s not that confusing at all. It’s a fictional game with fictional rules. So see it from Anthem’s universe perspective. The characters are interesting. Haluk is straight forward to us and he needs to stay cool at all times and not just on the battlefield. Owen is quite easily understood and his actions can make sense but not justified. Faye its quite realistic, she’s one of those people who’s so into their field of study or interest that people forget she has hobbies like radio series. Matthias is the brilliant but reckless type and the whole manifold incident made him even better. The other characters just add to the social flavour. You can speak to them from time to time and they clearly have their own views, focuses in life and stories. There are other characters that you can speak to and you get to decide how you respond to questions and situations. In one of them we convinced Amal, the bartender, to always do the right thing and be honest. We also couldn’t deceive the old woman (Marelda we think) by letting her think we are her dead son. What she needs is the truth, gentle but straight up truth. We truly helped her in the end. Yes, it has been said that no matter what you choose, the outcome isn’t effected by much but these conversations do test the player themselves, their morality and what they think. Nice touch. Now let’s talk a bit about what we don’t like. We don’t like that you can’t really decide what you can craft. 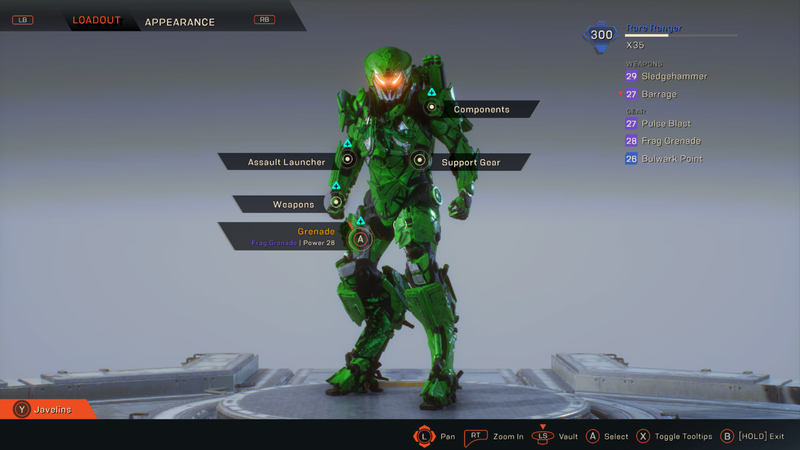 From the earlier parts of Anthem we happened to find a harvestable source during a mission (we played in private) and it released a crazy amount of masterwork ember. We had a lot of crafting material but couldn’t craft anything great. We later learned that you need to collect and then upgrade blue prints by completing certain weapon challenges. That wasn’t made clear to us. It should have been spelt out to players. Another issue is that moment in the story where you needed to enter four special tombs and those tombs can only be accessed by those who are worthy. You are worthy by completing specific challenges. Now what’s the problem? The challenges can take quite a while especially if you haven’t started anyone of them while you are playing missions. This whole section feels like a wall. Until you complete the challenges you cannot progress. We were fortunate to have only three more challenges remaining: melee kill a certain amount of enemies, complete world quests and find 15 chests (15 we think). It took quite a bit but not that long but we know other players had to spend a long time on it which isn’t fun. If they made it so that getting into the temples unlocks you weapons, upgrades, blue prints, techniques or whatever then it would be better and feel like rewards, instead of making that the actual main mission. We weren’t happy about this part at all. A small sized complaint is that we can’t feel that much of a difference when we equip gear that increases our armour and shields. We even crafted a couple of stuff and really increased both armour and shields but enemies seem to kill us at pretty much the same speed (we always play on hard difficulty). Maybe when we get much better gear we can feel the difference. Another issue is that the story could have included more encounters with the different groups like the regulators and how messing with them could have consequences. The outlaws could have their own branch of missions along with the scars; giving players the opportunity to know more about them and their whole system. There’s opportunities in there and we want to see Anthem take advantage more of what they have in their universe. One more issue is the items drops you get for beating certain enemies. X35 Earthwalker, the legendary soldier himself, literally earlier today in free play mode defeated an Ursix and got two epic items from it but later X35 fought a War Titan and beat it solo and the reward was a rare and uncommon. The war titan was stronger, had way more health, can do way more damage and took five times longer to beat but the drops were inferior. That needs to be fixed as that’s clearly not right. By the way we will show that fight against the war titan in a video in good time. Now some critics were complaining about the characters and the conversations you have with them. Let’s be real, the characters do what they need to do. They said the characters just stand around. Well what do you want? You want the characters running around in a route in fort tarsus so players have to chase them down just to get a mission or talk. Some really slammed Anthem for not having big story effected consequences based on your responses to some characters. This isn’t that kind of game (what’s wrong with these reviewers). Anthem isn’t about meeting clans, persuading them to join your cause and them lead an army and if you anger clans then they become enemies. It’s just conversations to keep things fresh, different and these conversations are interesting. People go through different things and it’s good to talk to others. Others slammed Anthem for having repetitive missions. We don’t find them repetitive. The developers can’t keep adding in completely different gaming mechanics all the time, there needs to be some sort of formula. Rescue and protect missions are not fun at all. There are limits on games especially those that are open world, RPG with world events and stuff to come. It can’t go on forever that’s why DLC have to come in bringing new stories and adventures. It’s sad that reviewers and critics don’t understand this. Like we said, ignore the critics and reviewers and certainly you tubers like angry Joe who just hop on the hate train to get views. Do your own research check out some gameplay and if you like what you see, try it for yourself. Now another thing that’s good is the Javelin customisation at least in terms of the colours. You can change the colour of each limb separately. It gets better. You can decide what shade of the colour, the fabric, patterns and even the texture. Players who have some level of creativity will go to work with these options and we still haven’t seen a javelin that’s just like ours. Even better we haven’t see one that looks like ours. 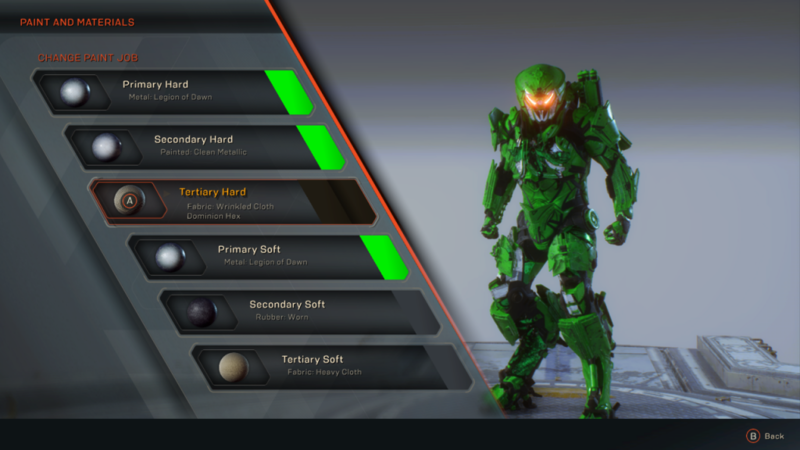 What we don’t like is how long it takes to get different helmets and javelin body parts. Keep doing missions to get coins and then rely on those. Or you could buy shards but we aren’t doing that. 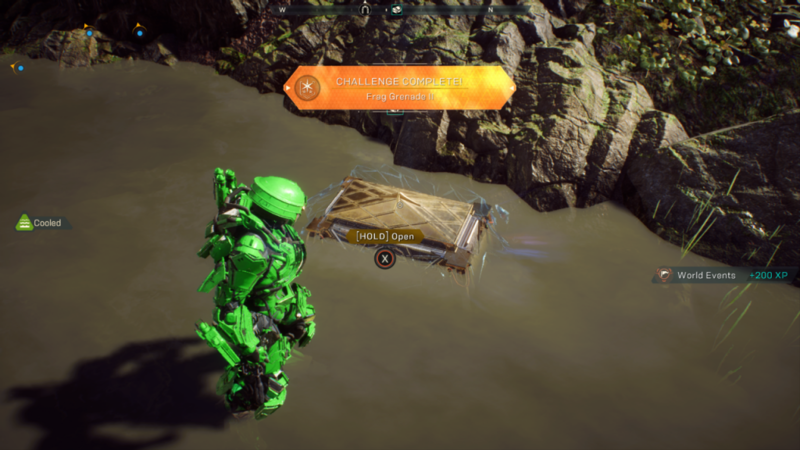 Overall we are really enjoying Anthem. The option to play with others is easy and just as easy to play alone. 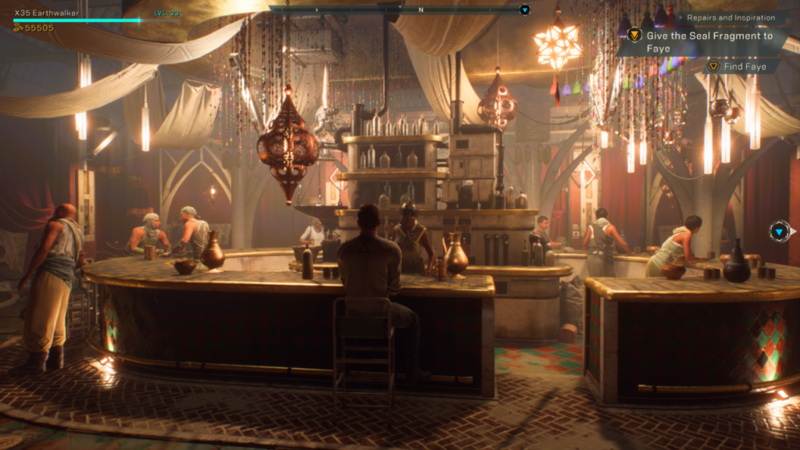 The Anthem world looks very nice and it does make you want to explore. Little things like how flying in rain helps your thrusters and reduce overheating while going in water or waterfalls completely cools you off, extending the amount of time you fly for. The weapon types definitely feel different. The pistols don’t feel like the scout rifles. The LMGs don’t feel like the assault rifles either. We like how much of a battle it is to take down a titan and when you finally do, it feels like an achievement because of how strong they are as enemies. The rabbits and other wild life creatures are cool. You can walk up to them, chill with them and even follow them around. The world definitely feels alive. Anthem has way more positives than negatives. Don’t forget that we haven’t gotten to the end of the story yet and we still have more to see. 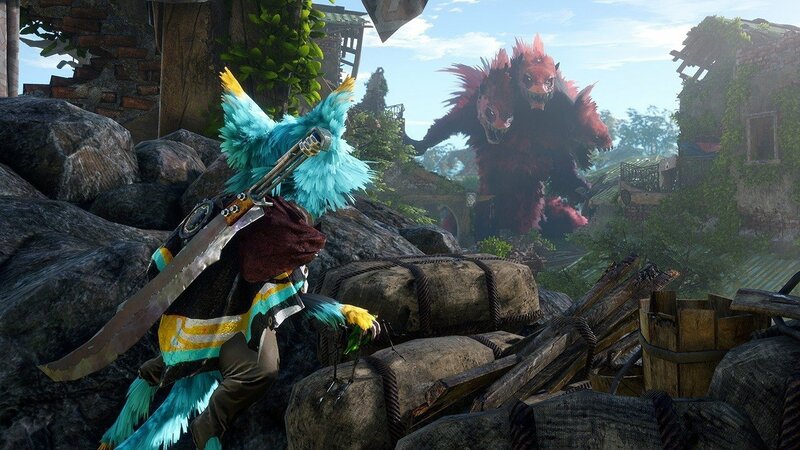 Biomutant is a new third person combat, action, open world RPG developed by ‘Experiment 101‘ and published by ‘THQ Nordic‘. Biomutant is said to be coming out in the second quarter of 2019 on the Xbox One, PS4 and PC. This game certainly stands out from everything else at the moment. Let’s take a look. Not a lot is known about Biomutant right now. Concerning the story we know that there is a tree. Not an ordinary one. It’s called the tree of life (once again getting their ideas from the Bible). This tree is for some reason bleeding death from it’s roots. A plague is also on the loose and it’s negatively effecting everything, including the land. There are different animal tribes and are currently not in agreement and against each other. So it’s up to one, the player to solve this. Either unite everyone or put everyone down. Now since Biomutant is a open world game players will assume there are ways of traversing the world. There is. Players can get around by foot (off course), jet-ski, mechs and even a air-balloon. Interesting since the game is set in an post apocalypse world. There are more methods of travelling like mounts but you’ll see for yourself. There’s more to this world than what you see. There is more under the planet surface and even high up. There are mountains to climb, tunnels to explore, the wildland which has seen better days, bunker networks and even an archipelago which looks cool by the way. So if it isn’t clear by now, players will need to be big on exploration in a game like this. Biomutant has a lot to do. First of all you have to learn what’s happening with the tree of life, handle the plague and deal with the tribes… but wait… there’s more. There are more mysteries to be solved, probably concerning the inhabitants. There are certain characters for you to find and meet. Some creatures need to be dealt with and discoveries to be made. The players action are said to play a part in the story, a major part. We have heard this all the time. Most games don’t do a good job at handle the “actions and decisions effect the story” system. 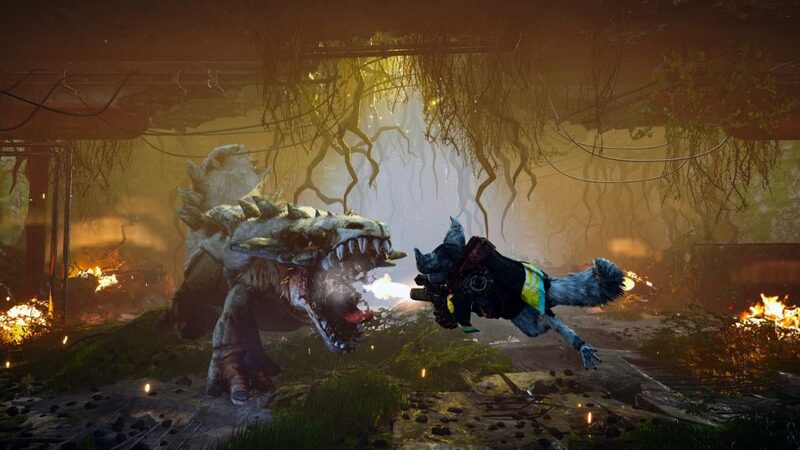 We hope Biomutant can do this well. By the way, the story will be told through a narrator. Biomutant does remind us of Metal Gear Survive in one very particular way. Areas that require certain equipment for the player to explore safely. In Metal Gear Survive you had the dust which was toxic for humans and you need an oxygen tank to temporarily survive. 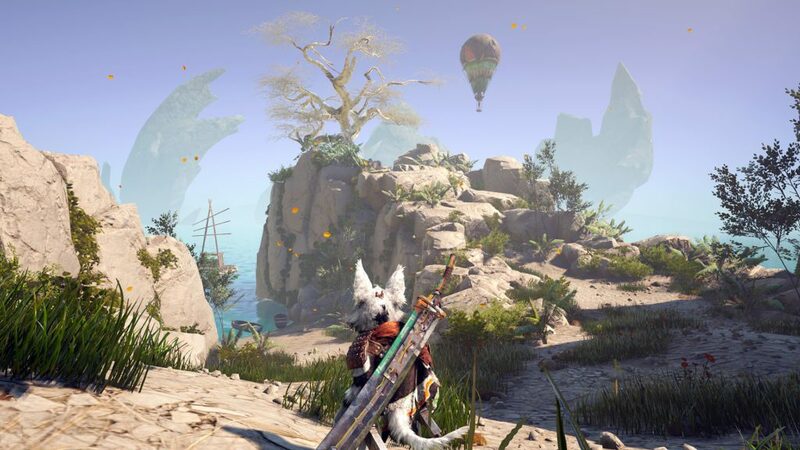 In Biomutant, players will need an gas mask and oxygen tank in order to explore the Dead Zones. Equipment is very important in this game. Players can equip protective hazard like gear to protect from bio-contaminated enemies and substances. You can even equip thermos-resistant clothes to handle those really cold areas. So the kind of gear you equip and wear is completely up to you but it makes a difference. 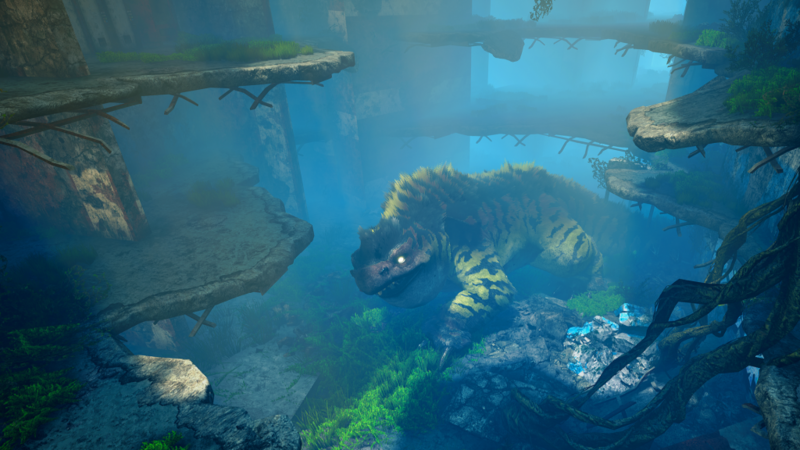 Biomutant wants to keep things new and exciting and here’s how. It’s third person combat and there’s some good emphasis on mobility and agility. You can move how you want and that’s how it should be. Combat is a mixture of melee, shooting and even powers and abilities from your mutations. The melee is martial arts. Your character can learn new Wushu combat forms through natural progression or from master fighters. Some make sure you know some kung-fu. Decide when to get up close and beat your enemy down and when to get some distance and range down the pain. We are looking forward to seeing how they mix these things together. If you was paying attention you would notice that we mentioned mutations. Your character is able to have his genetic structure re-coded. This will off course effect many things. For starters how you look will be different. Your attributes will be affected. If you receive exposure to radioactivity like the kind found in bunkers you” experience psi-mutations, your mind will be affected and you’ll learn abilities like elevation and telekinesis. If you get exposed to bio-contamination that will cause physical mutations like getting a barbed tail or even mantis claws. So there are many ways to develop your character. There is crafting in Biomutants too. Developers claim players are “totally free when crafting weapons”. You can craft guns like shotguns, revolvers and rifles (off course). Craft melee weapons, whether they be heavy melee type, or sharp like slashing and piercing. You can add different parts to add modifications like a battery powered chainsaw (Gears of war inspired) and go even further with bio-contaminated sludge vials. We did say players should explore, as you may encounter a character who might craft some stuff for you. These things can include, a jump pack, bionic wings (sounds awesome) and even upgrade your automaton. We checked out some gameplay and from what we can see, things look great. The graphics are very good, the world and areas look really interesting. The sounds are just good so far. The different animal mutant enemies don’t look so tough. The customisation and outfits your character can wear are showing some good variety right now. The giant monsters look like a real problem though. So far we are seeing high potential with Biomutant. World War Z is a new zombie third person shooter action game developed by ‘Saber Interactive‘ and published by ‘Focus Home Interactive‘. 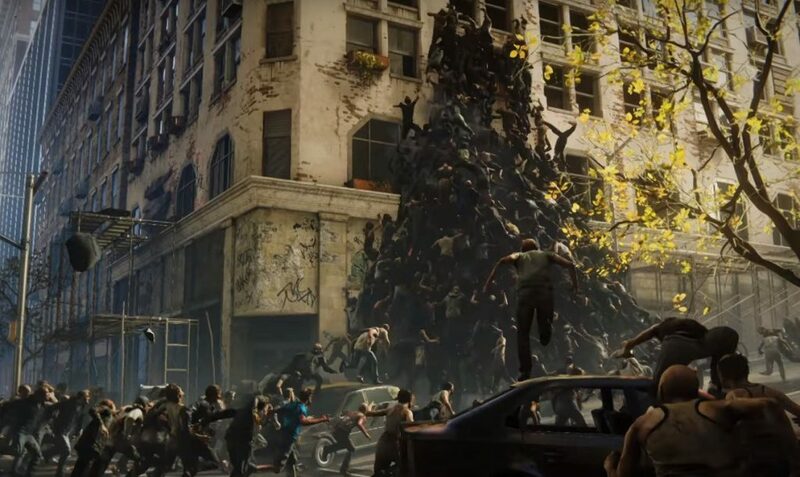 World War Z will be coming out the 16th of April 2019 on the Xbox One, PS4 and PC. Zombies have always been a problem but in here… there’s too many. Let’s take a look. 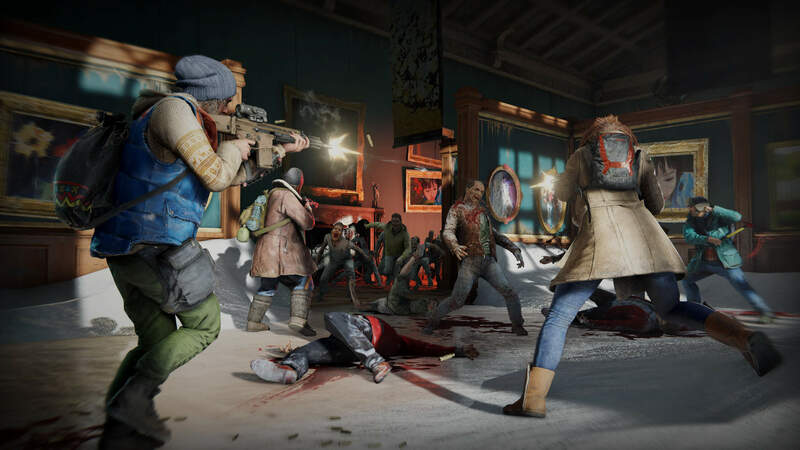 In World War Z players will be playing through the stories of others around the world. So no, it isn’t just America this time. Jerusalem, New York and Moscow have been named. So this means, different environments, different characters and different objectives. Humanity once again is near extinction. The zombie swarms are in the millions and it’s up to a group of people who are working together to survive and hopefully beat the zombie hordes. Do players have what it takes? First of all let’s say this as we are all thinking it. How comes four regular people just get some guns and are able to survive and beat the zombies successfully but the whole Israel, Russian and American army get defeated. The army are filled with professional soldiers who practice in firing ranges and should know how to aim for the head. They have tanks, artillery, helicopters, ships, bombs, nukes and more but yet they all lose while a lone cop like Leon Kennedy, or some high school cheerleader or a pub owner who finds a shotgun or a pistol can survive and defeat many. Zombie movies and games have yet to explain this consistently. We aren’t letting World War Z off from this point. World War Z off course is following the World War Z movie so expect the same kind of zombies. These aren’t the traditional slow moving zombies. Oh no! These zombies, run, sprint (for some reason), jump, reach and chase you down. They will let nothing stop them. If you jump across a gap, they will jump too. If you go through a door, they will try to break it down. So let’s go to the top of a elevated area. That won’t work. Why? Well these zombies keep rushing at your location that they will pile up on each other. The pile will eventually reach up to where you are as they are climbing up each other. So you aren’t really safe anywhere. They will do their best to find you. The Zombies in World War Z also are off course fearless. Having big guns, a wall, vehicles or even numbers doesn’t bother them in the slightest. They will rush you regardless so players can’t sit around and wait. Also the zombies cannot be reasoned with, so don’t expect any second chances or mercy from these guys. The zombies here are going to require gamers who can think fast, plan well and work well together. That’s right, World War Z is co-op. You will not face the zombie horde alone. You will team up with three others. There are six characters classes: Fixer, Hellraiser, Exterminator, Slasher, Gunslinger and Medic. Off course each one has a clear role, for example medics are all about healing and keep everyone in top shape, Fixer will be in charge of fortifications and equipment, Slasher is going to get up close and do some melee damage, we assume Gunslinger will have advantages and buffs concerning guns. Exterminator, and Hellraiser aren’t so clear but we assume that turrets and even explosives will relate to them. Players will need to find out what they are best at and start training. In terms of weapons there isn’t that much to say because it’s what you would expect. No weapon, when against a zombie horde should be off limits. We would even use our car keys if we have too. World War Z will have barricades like barb wires. Traps, guns, sentries. Those aren’t enough to stop a horde though. Good thing, there is more. Machine guns, grenade launchers, rocket launchers and turrets. Now that’s more like it. We checked out some gameplay and it was what we thought it would be. More like defend the area and tower defence in some ways. You rely heavily on your set up, where you place the barricades, where you decide to fight from. 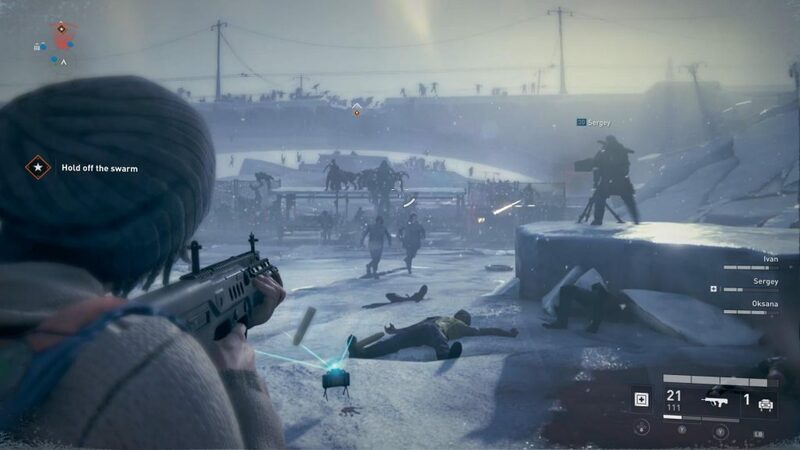 World War Z also has procedural enemy and items spawns which the developers claim is based on the players performance. There are claymore mines, frag grenades a crossbow, a double barrel shotgun and even C4. We do wonder about the difficulty and how much damage zombie swipes do. Also can zombies grab you to temporarily stun you? Guess you must play to find out. Warhammer: Chaosbane is a new action RPG, Hack and slash game developed by ‘Eko Software‘ and published by ‘Bigben Interactive‘. 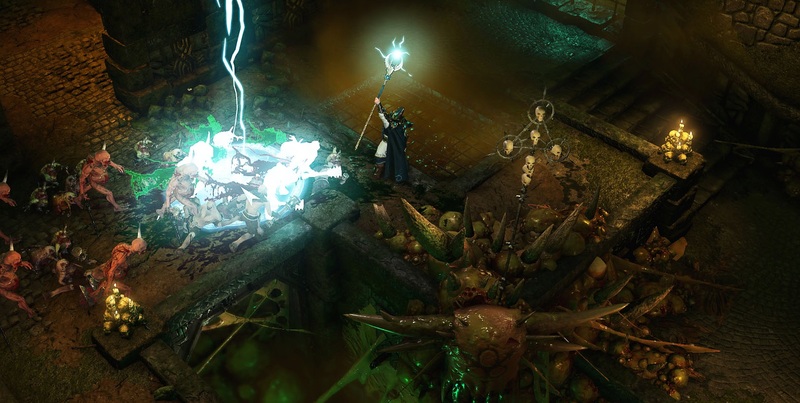 Warhammer: Chaosbane is coming out the 4th of June 2019 on Xbox, PS4 and PC. This game has been related a lot to Diablo and others. Let’s take a look. Players are in the Warhammer universe. You, know the same place where the space marines are. 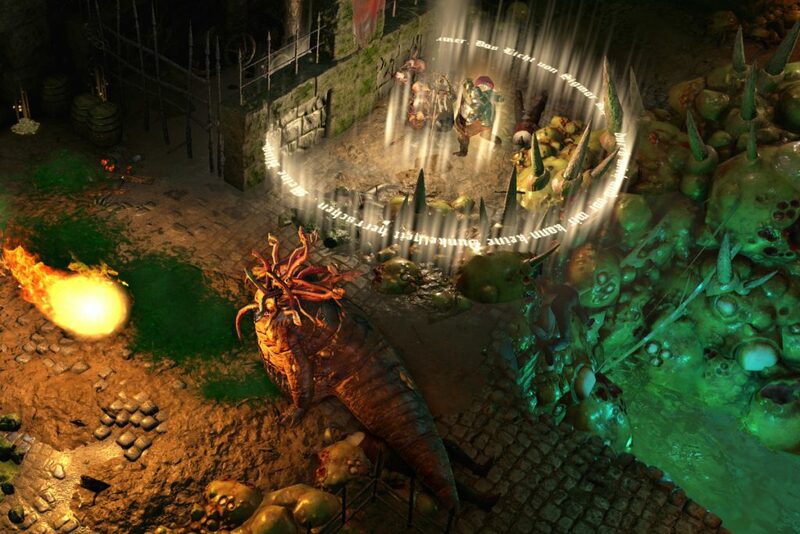 Warhammer: Chaosbane is a world that’s dominated by magic and war. The enemy is the horde. A chaos horde. The story is simple and the action is what you’d expect. There are four character classes in Warhammer: Chaosbane. Wielding some very powerful artefacts. There’s a high elf who’s all about ranged attacks with magic, an empire soldier who’s basically the tank of the group, a wood elf who uses lethal traps and has a bow (there’s always a bow), a dwarf who just loves melee combat. So it’s the typical tank, ranged, magic and traps. Pick your type. Now notice that there is four types of characters and it’s a hack and slash with that high up camera and there’s loads of enemies. You just know Warhammer: Chaosbane has multiplayer. We are right. It’s four player co-op. Both online and local. We always appreciate it when developers allow local multiplayer. We respect that. There’s more to this typical hack and slash than you think. Warhammer: Chaosbane has some replay value as there’s a boss rush mode which is all about facing the bosses (obviously), they claim to have regular updates and countless dungeons. There’s over 70 different enemies. These enemies aren’t alone as they will also work alongside powerful bosses and even chaos gods. There are more than 180 different skills for players to learn and use to destroy the enemies and keep that advantage. Don’t forget to use your bloodlust ability. Just saying. We checked out some gameplay and it’s what we thought it would be. Run around, see enemies, they rush you, you use your abilities and whatever to survive. A hack and slash for sure. If you’ve played games like this before, then you would understand. Games like this stick to this style. Quite a bit of work went into this game. Warhammer fans will recognise some famous locations like Nuln or Praag in this game. Celeste looks cute simple and quite quick but actually that changes quite quickly. Let’s explain. When you start Celeste you see the work put into the music and the details. You start the first area, the prologue and get use to running, jumping and climbing. Once you learn about the dash, experienced gamers just know it’s about to get more complicated. The first actual level is not even easy. You must learn to control yourself while in the air, time your dashes and interactive with some mechanics that’s exclusive to this level. You learn that Celeste definitely requires precision and timing. Spikes in abundance to punish all mistakes and even a spring trap that launches you into death. You learn the hard way that there’s no mercy in Celeste. Each level has their own mechanic which players have to master. Trust us when we say, learn them now. In every level players can initially aim for certain things. Off course beat the level, collect all the strawberries, find the blue crystal heart and find the B-side tape. The B side tape is medium difficulty in our opinion, a few are well hidden while most just requires you to look around. Collecting all the strawberries is hard as they are in places that tests the players skill and ability to use your available action in the right order, most of the time. The crystal hearts though are a different story. They are basically tricks. You either know the trick or you’ll never get them. The first one requires you to dash in certain directions in a specific order. You know what direction based on the direction the colour coded birds are moving and you get the order from the machine which keeps flashing the same colours in the same order. Cryptic right? We know! The game tells you that the strawberries don’t do anything and that’s a lie. We at X35 Earthwalker hate lies! You have youtubers and big review companies agreeing and saying they don’t do anything too. Just shows how inexperienced and not good at paying attention they are. The strawberries actually only have an effect at the end of the game. When you complete it, your character will bake a strawberry cake for certain guests. How much strawberries you collect will effect the selfie that Theo takes and the dialogue. If you hardly collected any, then it will be a plain cake and the guests will look confused, disappointed and even skeptical of whether it still counts as a strawberry cake or not. If you collect all of them then the cake is loaded with strawberries everywhere and everyone looks like they are having the time of their life or completely amazed. They also give some serious compliments. So go get those strawberries. Once you beat the game, your next challenge is to take on the B side of the levels which you unlock with the B side tapes. Let us warn you now. This is where the fun stops. You thought the reflection and summit levels were hard then you aren’t ready. B side is basically a much harder version of the level you played. More spikes, less mercy and more death. You will fail and die, again and again. Many players have given up because of the B side levels and they are crazy. They force players to get good or git gud. Every trick you have learnt and every combination will be used here. There’s no way around it. The levels are as long as the original but when you see what the game wants you to do to get through it, you just have to say “come on Celeste… This isn’t fair”. Once you figure out what the game wants you to do though, it’s only a matter of time before you execute it right and get it done. These levels aren’t impossible. You need all the crystal hearts and hearts you get for beating B side to challenge the B side of the chapter 8 ‘the core’. What we haven’t seen though is a video of the developers beating these B side levels. We bet they can’t. Now if you beat all the B side levels you can call yourself a Pro level Celeste player. Congratulations you beat the B side levels. You can rest now… actually you can’t. What? You thought you was done? Nope! Beating all the B side levels and finding all the crystal hearts will allow you to challenge the C side levels. C side are the real deal. They are completely unfair, punishing levels that only the best can beat. They are harder than B side but much shorter than B side. The most is three rooms while there are some with almost only two rooms. Each room requires all the tricks and at times including the new trick you learnt from the B side level of Summit. That’s one thing we hate. 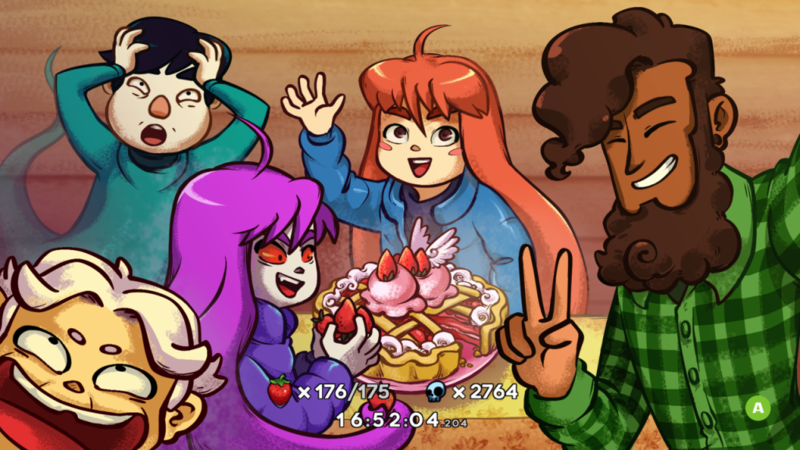 Celeste teaches the players a new trick at the end of the game and they then expect you to master it and use it for the rest of the levels and challenges ahead, instantly. 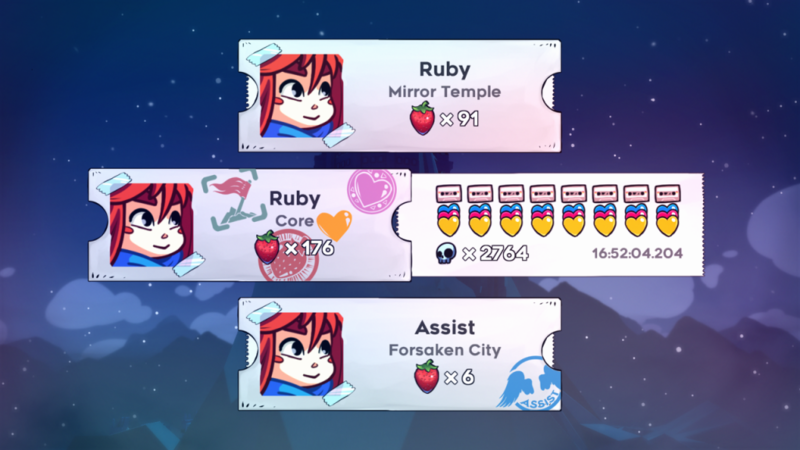 C levels are so tough that only 0.64% of all the Celeste players on the Xbox One have beaten them all! 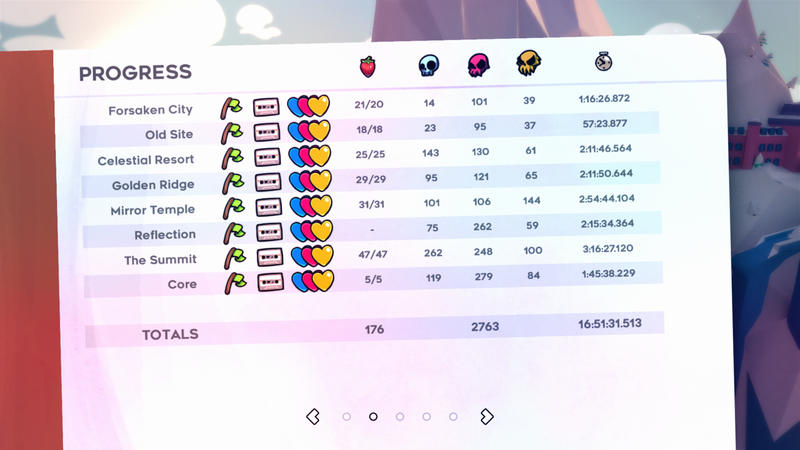 The last C side level is brutal but fair and that’s how all the challenges should have been but some felt very chance based especially with some mechanics like the clouds and getting the exact timing. The last level is the longest room in the game with all the mechanics from the previous levels and no check points. You can watch how X35 Earthwalker, the legendary soldier himself took on this level. As you complete the different challenges in Celeste, your ticket (your save file) gets different stamps on it. When you beat the game, you get a mountain top flag stamp. When you get all the strawberries you get the strawberry stamp, another thing the strawberries do (the strawberries don’t do anything… liars). When you beat all the B sides you get a heart stamp but when you beta all the C sides you get another heart stamp. Fill your cards up with stamps and feel proud of yourself. Also the last challenge in our opinion is to now get all the Celeste achievements which are reasonable. You can also collect the golden strawberries but after beating C side, you start to get fed up with the game. It’s fun to play from time to time but the difficulty and what you go through makes you want to finally put it down when you are done. Want to see something awesome? Apex Legends is the latest big Battle Royale that came out and almost all gamers are talking about it. Apex Legends was developed by ‘Respawn Entertainment‘ and published by ‘Electronic Arts‘. Since it’s a Battle Royale, gamers should already know what to expect. Apex Legends is the latest game to challenge Fortnite. Let’s take a look. 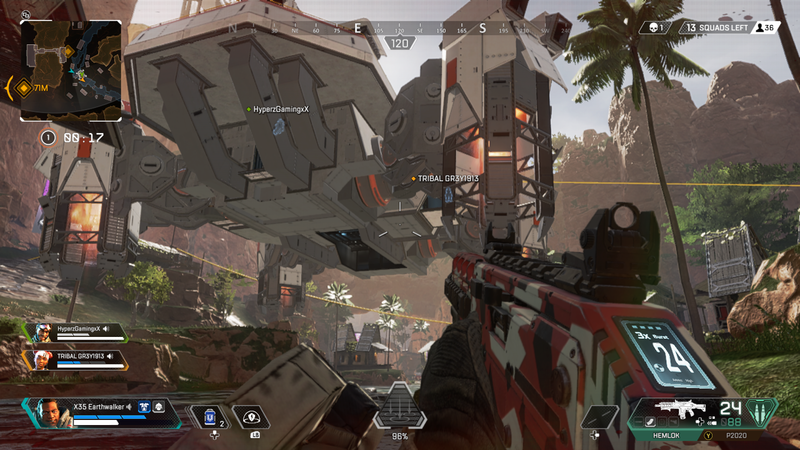 Apex Legends takes place in the same universe as TitanFall. Players control one of the legends. The legends are characters who are all competing in the Apex games to be known as the Apex champion. Each character has their own story, abilities and off course strengths. How you use these characters and work with others will make a big difference in matches. That’s right, we said work with others. In case you couldn’t tell Apex Legends drop players in teams of three. So working and communicating with your team is essential. Sure you can go by yourself and even still win but that’s unlikely. Don’t be the players who just wants to do what you want and just leave your team behind or not care. If you are a selfish gamer then don’t play as you’ll just ruin other gamers experience. Many gamers are trying to figure out what’s the best character combinations in the game. Players want to have characters that can cover all the needs in a team based Battle Royale. There are currently 8 characters but only 6 are available from the start. The other two must be unlocked. Each legend has a passive, tactical and ultimate ability. The legends are: Lifeline, Gibraltar, Mirage, Pathfinder, Bloodhound, Wraith, Caustic and Bangalore. To simply give a few examples, Lifeline produces a shield while reviving knocked down allies, use healing items faster and call in some very good defensive gear. Gibraltar produces a small shield while aiming down the sights of his weapon, can create a dome shield that blocks projectiles and call in a mortar strike. Mirage can create holograms of himself to fool and trick enemies while up and kicking or even downed. Pathfinder can create grapple lines for himself and his team to reach any location and also use terminals to reveal to his team the next ring location ahead of time. Bangalore gets a speed boost when she is being shot at, can fire out smoke canisters to create a wall of smoke and even call in an artillery strike. These legends are serious. Like other battle royale games, players start in a transportation vehicle that flies across the map and it’s up to the players to decide when to launch from the vehicle and where they want to land. 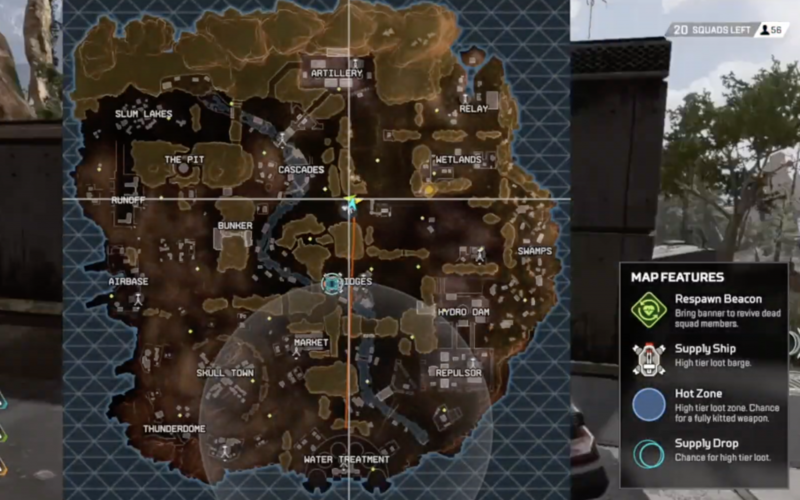 In Apex Legend the only player who decide when a team launches is the ‘Jump master’. The Jump master after launching then controls and directs the whole teams flight and movement to the surface. Off course players have the option to stop following the leader after holding a certain button for a few seconds but normally the jump Master is in control. There are supply bins that carry potentially carry armour pieces, weapons, ammo, grenades etc. Items and gear can also be found in buildings, on roofs, care packages, in small droids, basically everywhere. The game map is quite detailed but provide all the information you need for locating and finding your team and way around the map. The circle that closes isn’t that dangerous initially. The first time the circle closes, the area outside of the circle does very very little damage; however the second time it closes in the damage increases drastically. Players in Apex Legends don’t have armour in the same sense as Call of Duty Blackout. They have shields from the body armour. 50, 75 or 100. The shields always take the hit before your health does. The helmet only reduces the amount of damage you take from headshots. Apex Legends does stand out from other Battle Royale definitely. We feel that Apex Legends is a combination of Call of Duty Blackout and Skyforge Battle Royale (our favourite battle royale). It moves and has a more realistic feel like Blackout but has the different characters and abilities like Skyforge. You can read our blog on Skyforge right here. The different abilities allows for different layers to the game, more skill to be displayed and off course different strategies. We like that the game is quite deep with a nice menu system, different types of ammo and the communication options. You can tell your team that you are defending an area, that someone has been here, mark locations for your team to travel to or look at and mark enemies you see. Communication is key. You can bring back your dead allies by returning their recovered tag to a specific machine. There are lots of goods things that we won’t go into detail on. There are some problems though. For starters the shields feel too weak. You can have purple body armour giving you the maximum amount of armour but one enemy can still melt your shields and health at times almost instantly. Shields should be stronger. This is also the same for Gibraltar’s passive shield ability. His shield doesn’t make a big enough impact. We’ve seen a purple armour wearing Gibraltar use his shields and face one opponent in a one on one and get downed first even when not missing much shots. The shields need a buff. The incinerate grenades need to cover a wider area to be more useful as the other two outclass it easily and therefore not worth carrying around. Apex Legends needs to keep it’s console and PC players separated. The main problem with Apex Legends though is that since it’s heavily team based, you will most likely lose if you have a bad team. X35 Earthwalker twice had a match where both team members literally split up and went their own different ways while landing. Both died within 30 seconds of landing but X35 Earthwalker lived. You are dependant on your team. They need to have a solo mode quite soon. This game isn’t perfect.